Conceptualize a campaign to energize supporters of the AFB and raise awareness about their positive impact on the lives of people with vision loss. Deliver detailed concept art and supporting guidance to the AFB marketing team. We all learn about Helen Keller in school. But learning about the work of AFB -- the organization to which she devoted the later years of her life -- is also incredibly educational. From policy initiatives like the Americans with Disabilities Act to research and technology and training of professionals and families, they have made an enormous difference in the lives of people with disabilities. We interviewed staff extensively, and ultimately conceptualized a full campaign strategy. In designing printed and interactive materials, we stayed close to the AFB brand while also working to expand the audience's perception of what AFB has done for the world. We conceptualized print collateral for AFB including a booklet, brochure and mailers. 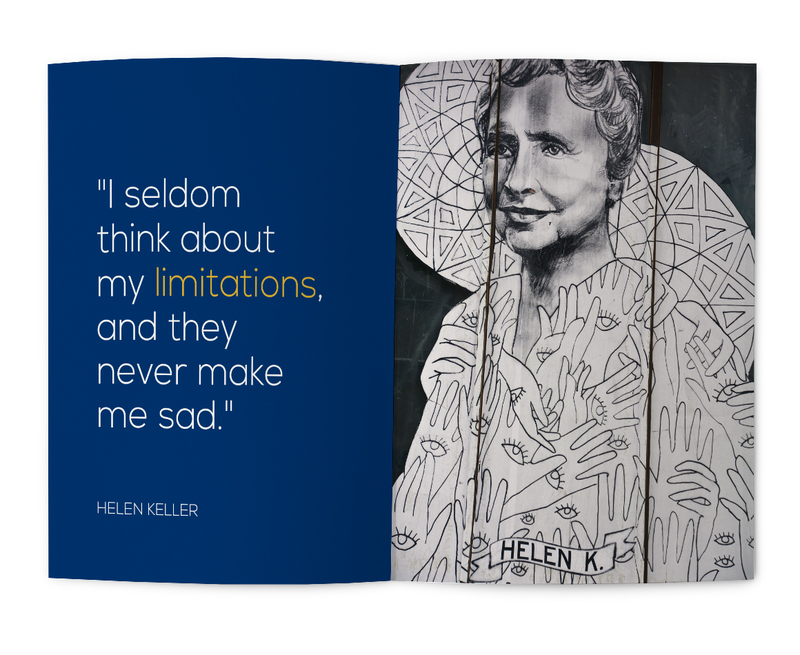 The booklet and brochure were designed to show the connection between the messaging and the historical face of AFB: Helen Keller. It also was intended to reference the resources AFB has to offer and the impact of the organization on the lives of those living with visual impairment. We also created two separate mailer concepts: one that focused on thanking donors, and one that focused on gaining new donors. They were designed to be clean and simple to grab audiences’ attention quickly and spark a response. The No Limits campaign was created to empower disabled Americans to feel uninhibited and empowered to live their lives free of limitations. Although the use of Braille on a billboard (like this example) is more symbolic than practical, all Braille text in the campaign is correct and literal. 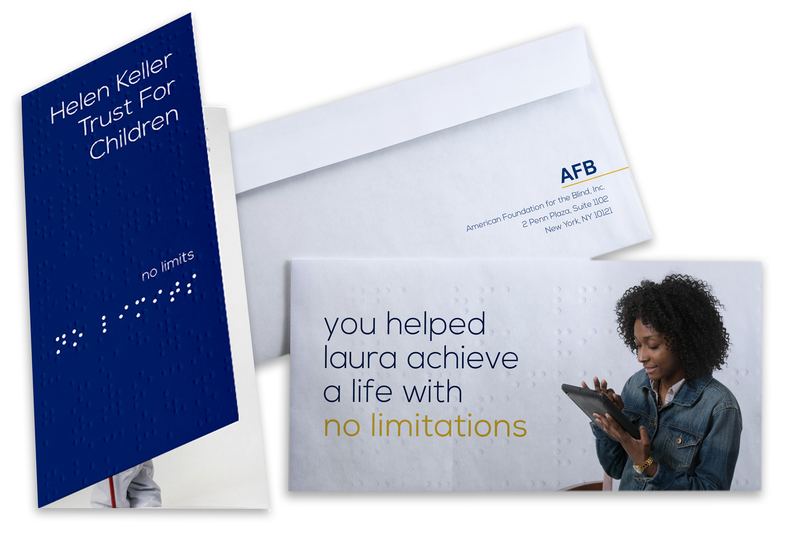 The campaign design concepts account for the use of raised text on print collateral to accommodate Braille readers. 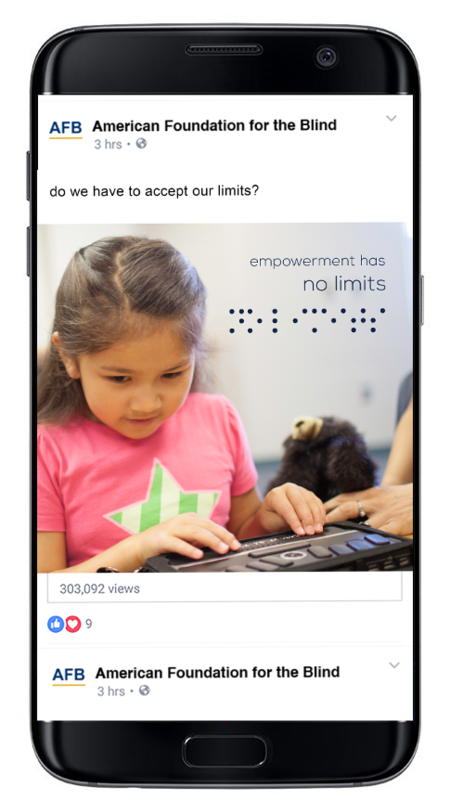 The campaign designed for the American Foundation for the Blind encompassed multiple digital media platforms including Facebook, Instagram, Twitter, Email, pay-per-click ads and more. Using data and demographics, posts are targeted to specific audiences. To increase reach, each post would have relevant tags and hashtags and selected posts would be boosted. Having an online reach adjacent to a print campaign allows audiences to be retargeted and see the message more than once. When audiences see a message multiple times, it’s more likely to create a response. The goal is to further the messaging and show there are no limits to empowering those who are visually impaired. TV commercials are a longer form platform, which provides an extended opportunity for storytelling that supports the "No Limits" messaging. The commercial concepts included stories that emphasized advancements in technology and access to education as necessary resources to help those who are visually impaired truly live a life with no limits. The TV commercial were also designed to be repurposed as online media via YouTube, Facebook and more. noun the process of making sure the copy and images on your website are friendly and visible to visitors and search engines alike. noun creating a unique combination of design, sign, symbol, and words to produce an image that identifies an organization and differentiates it from its competitors. noun creating a 'stick figure' version of your website design; creating a road map to success on a website project. noun a system that allows website administrators to take control of their content and create a more active website presence.